There is a such a pleasing geometry to the architecture of Nicholas Hawksmoor’s Christ Church, Spitalfields, completed in 1729, that when you glance upon the satisfying order of the facade you might assume that the internal structure is equally apparent – but in fact it is a labyrinth inside. Like a theatre, the building presents a harmonious picture from the centre of the stalls, yet possesses innumerable unseen passages and rooms, backstage. When I joined the bellringers in the tower at New Year, I noticed a narrow staircase spiralled up further into the thickness of the stone spire, beyond the one I had climbed to the bellringers’ loft. Since then I have harboured a burning curiousity to ascend those steps, and yesterday I returned to climb that mysterious staircase to discover what is at the top. As you ascend the worn stone steps within the thickness of the wall, the walls get blacker and the stairs get narrower and the ceiling gets lower. By the time you reach the top, you are stooping as you climb and the giddiness of walking in circles permits the illusion that, as much as you are ascending into the sky, you might equally be descending into the earth. There is a sense that you are beyond the compass of your experience, entering indeterminate space. No-one has much cause to come up here and, when we reached the door at the top of the stairs, Iesah Littledale, the head verger, was unsure of his keys. As I recovered my breath from the climb, while Iesah tried each key in turn upon the ring until he was successful, I listened to the dignified tick coming from the other side of the door. 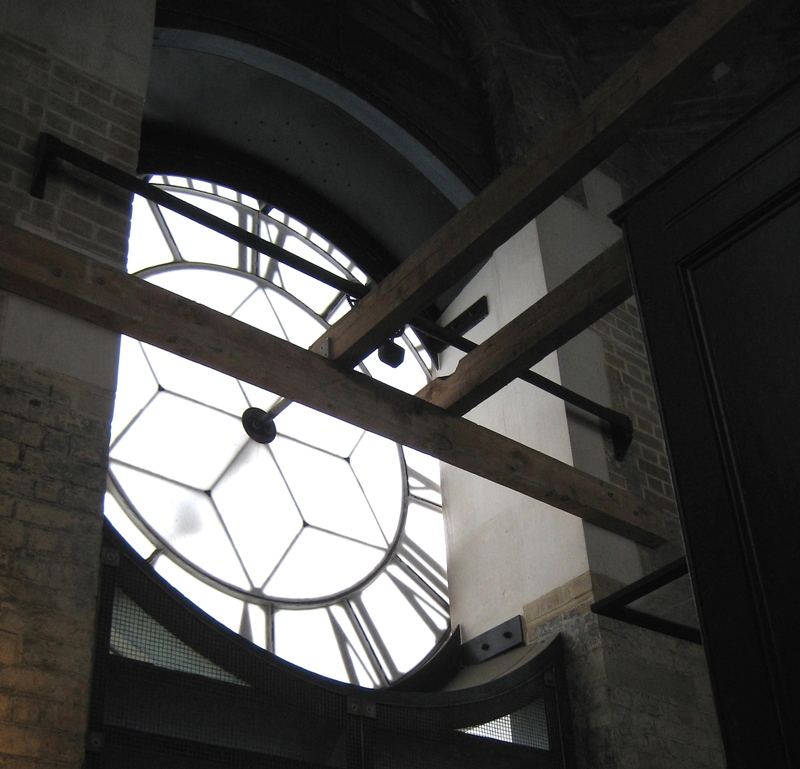 When Iesah opened the door, I discovered it was the sound of the lonely clock that has measured out time in Spitalfields since 1836 from the square room with an octagonal roof beneath the pinnacle of the spire. Lit only by diffuse daylight from the four clock faces, the renovations that have brightened up the rest of the church do not register here. 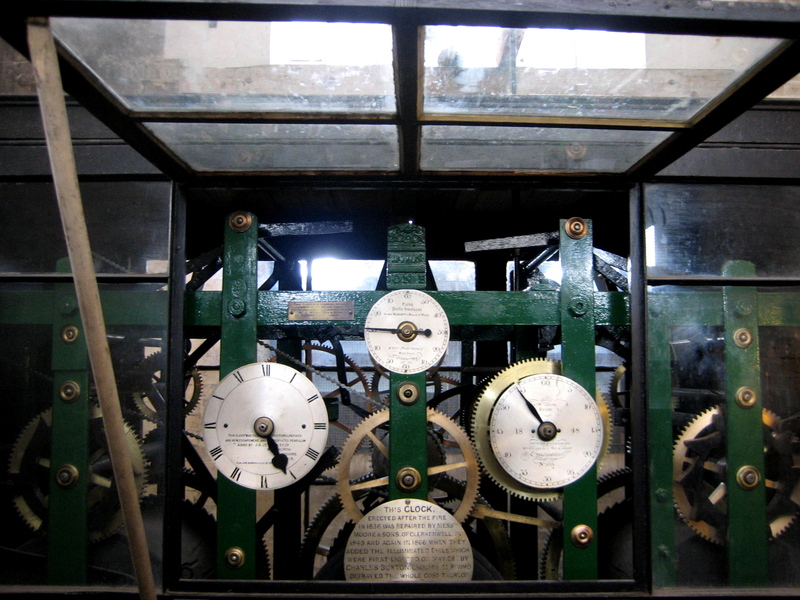 Once we were inside, Iesah opened the glazed case containing the gleaming brass wheels of the mechanism, turning with inscrutable purpose within their green-painted steel cage, driving another mechanism in a box up above that rotates the axles, turning the hands upon each of the clock faces. Not a place for human occupation, it was a room dedicated to time and, as intervention is required only rarely here, we left the clock to run its course in splendid indifference. By contrast, a walk along the ridge of the roof of Christ Church, Spitalfields, presented a chaotic and exhilarating symphony of sensations, buffered by gusts of wind beneath a fast-moving sky that delivered effects of light changing every moment. It was like walking in the sky. 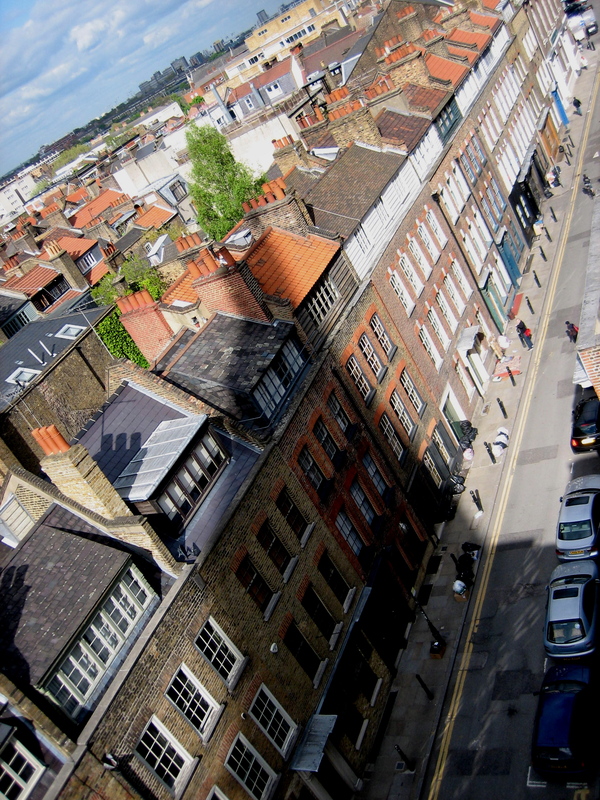 On the one hand, Fashion St and on the other Fournier St, where the roofs of the early eighteenth century Huguenot houses topped off with weavers’ lofts created an extravagant roofscape of old tiles and chimney pots at odd angles. Liberated by the experience, I waved across the chasm of the street to residents of Fournier St in their rooftop gardens opposite, like one waving to people from a train. Returning to the body of the church, we explored a suite of hidden vestry rooms behind the altar, magnificently proportioned apartments to encourage lofty thoughts, with views into the well-kept rectory garden. From here, we descended into the crypt constructed of brick vaults to enter the cavernous spaces that until recent years were stacked with human remains. Today these are large, apparently innocent limewashed spaces without any tangible presence to recall the thousands who were laid to rest here until it was packed to capacity and closed for burial in 1812 by Rev William Stond MA, as confirmed by a finely lettered stone plaque. Passing through the building, up staircases, through passages and in each of the different spaces from top to bottom, there were so many of these plaques of different designs in wood and stone, recording those were buried here, those who were priests, vergers, benefactors, builders and those who rang the bells. 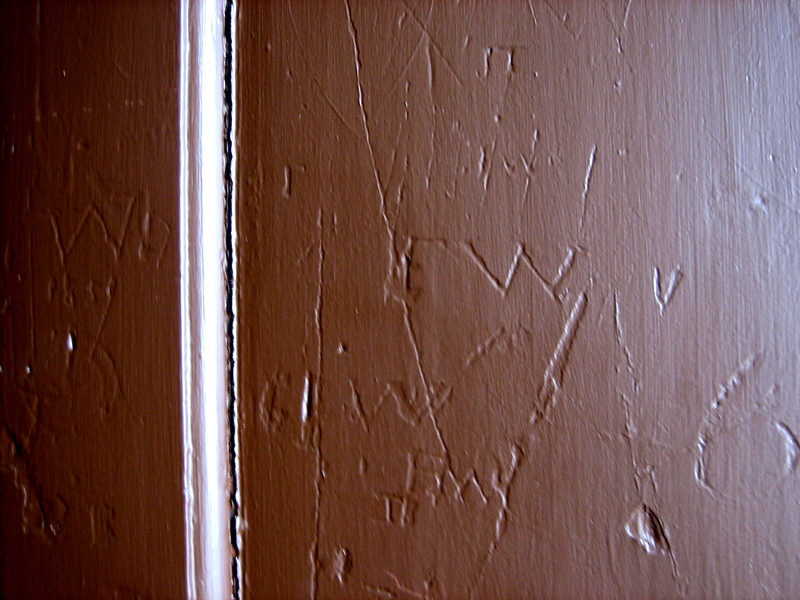 In parallel with these demonstrative memorials, I noticed marks in hidden corners, modest handwritten initials, dates and scrawls, many too worn or indistinct to decipher. Everywhere I walked, so many people had been there before me, and the crypt and vaults were where they ended up. 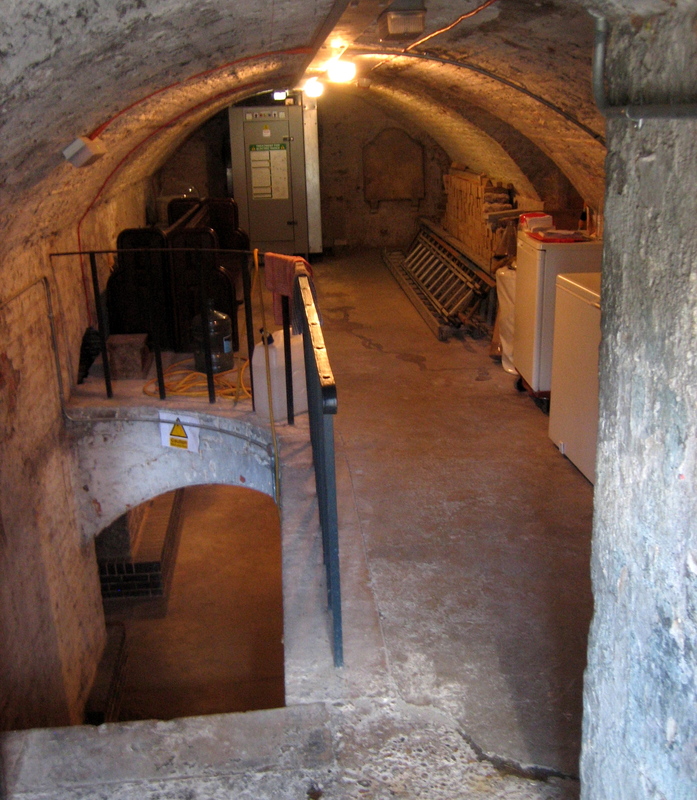 My visit started at the top and I descended through the structure until I came, at the end of the afternoon, to the small private vaults constructed in two storeys beneath the porch, where my journey ended, as it did in a larger sense for the original occupants. These delicate brick vaults, barely three feet high and arranged in a crisscross design, were the private vaults of those who sought consolation in keeping the family together even after death. All cleaned out now, with modern cables and pipes running through, I crawled into the maze of tunnels and ran my hand upon the vault just above my head. This was the grave where no daylight or sunshine entered, and it was not a place to linger on a bright afternoon in May. Christ Church gave me a journey through many emotions, and it fascinates me that this architecture can produce so many diverse spaces within one building and that these spaces can each reflect such varied aspects of the human experience, all within a classical structure that delights the senses through the harmonious unity of its form. 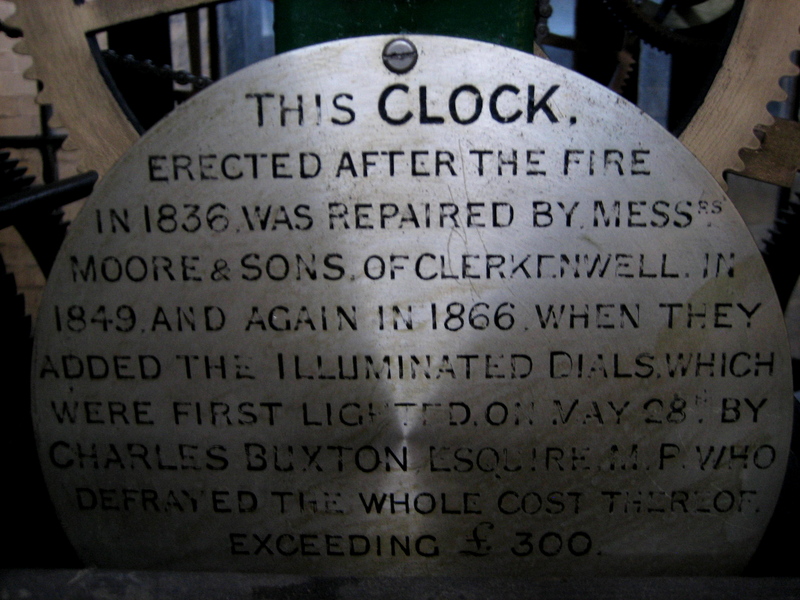 The mechanism of this clock runs so efficiently that it only has to be wound a couple of times each year. 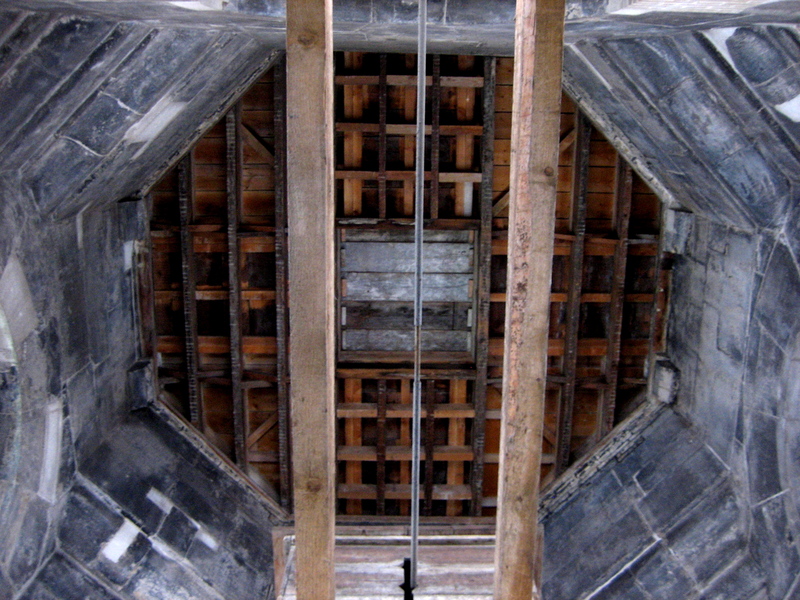 Looking up into the spire. 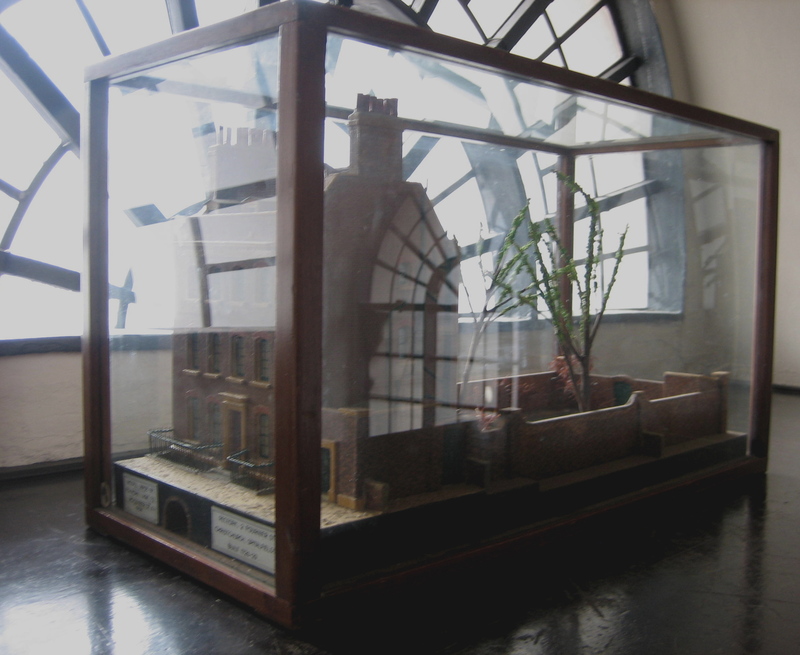 A model of the rectory in Fournier St.
On the reverse of the door of the organ cupboard. Beneath the porch,two storeys of vaults descend into the earth. For nearly three centuries, the shadow of the spire has travelled the length of Fournier St each afternoon. Thank you for this tour of a remarkable place. It cannot have been easy to take some of those fine photos, that capture the complexity of the building, and the splendor of the rooftop view. Your posts show such variety and excellence! Thank you for the “backstage tour.” The clockworks are amazing, and I wish my father were alive to see your pictures. Every week he climbed the steeple of his village church here in New Hampshire to wind the clock. The bell was forged by the patriot/silversmith Paul Revere, a Huguenot like so many in Spitalfields. An absolutely fascinating post about Christ Church, that puts my own attempts to shame! I am so envious that you got to go behind the scenes – it must have been enthralling and also so atmospheric. I’m really fascinated in the area of Whitechapel (am currently researching a book about Mary Jane Kelly) and will be following your blog with great interest from now on. Thank you for a great read. This is fantastic, the clock mechanism pictures and the shadow of the spire on Fournier St terrace. Absolutely my part of London. Very nicely captured. (Thoughts for future posts, unless you’ve already done them, are Bunhill Fields, Wesley Chapel, and the Peabody estate, all a short walk away). As soon as you mentioned “unseen passages and rooms,” I was ready to go, metaphorically standing with the tour group ready for our guide to begin. But then I read, “There is a sense that you are beyond the compass of your experience, entering indeterminate space,” and suddenly the tour veered into a more philosophical realm. I was intrigued. Thanks for a wonderful essay to take me far and wide during my lunch hour. I love going “backstage” in old churches but rarely get to do so. Thank you for taking us where most are rarely allowed to go. Brilliant photos … I really want to go see now! As a regular attender at Christchurch, it is very interesting to see the parts of this splendid building not normally on view! every day i walk my dog past the church at 3pm, so fascinating to see the inside. When I first saw Christ Church in 1957, the portico had massive Victorian railings to match and I read somewhere that their purpose was to keep streetwalkers at bay; especially on cold, damp evenings. I very much enjoyed your tour of Spitalfields church. Especially your description of the atmosphere of the place. Since we are visiting London in a fortnight, I ‘ve planned to visit some of the the churches designed by Hawksmoor. After reading your account of it, I will certainly visit Christ’s Church. Í’ve been rereading the novel by Peter Ackroyd: Hawksmoor, which appeared in 1985. If you haven’t read it yet, you really must. The book’s mood reflects exactly your experience of your tour of the church; chilling and awe-inspiring. Thank you so much for a marvellous tour of Christ Church. Some of my ancestors were buried there so with great interest I visited in 1996 and 1997. What a wonderful tour! My Rondeau family attended the church, and John/Jean Rondeau was Sextant. His remains are at the History Museum, and our Whitby,Ontario cousins visited him. There are many of John Rondeau’s family scattered across the USA from Kentucky to Arizona,from Michigan to Washington. Your informative stories keep us connected. Thank you/Marci. A wonderful article – thank you for a memorable and evocative read! I also enjoyed the article about Dr. Clegg, the keeper of the bodies removed from the crypt. I hope that she will be kind enough to post on London Rootsweb a list of the names, ages, relationships if known, and dates of death from the coffin plates of the dead she has been able to identify. 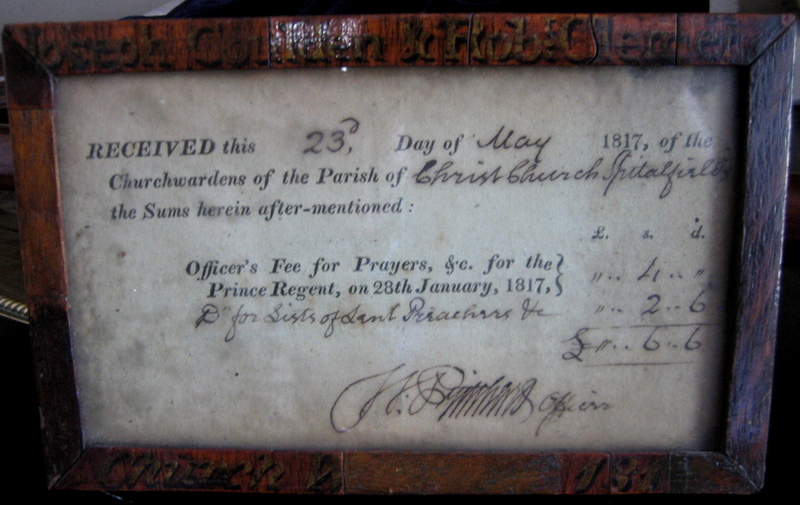 This will a blessing for people whose ancestors lived in Spitalfields, and who are trying to trace their families. first thing i would see in the morning , last thing at night .never needed a watch.played inside it in the park next to it , had my first kiss there too .been up west with friends ,come back and all would get a meal at the golden glove snack van by the gates. drank in the ten bells with great friends next to it .lived opp it worked opp it . met royalty out side it,and most of all one of the best parts of my life around it,and thanks to all i have known around it.what more can i say.